We anticipate that 2015 will be a great year for birding in western North Carolina, so why not start this year’s 12 Months of Birding at the Inn series with a great bird, specifically the Great Horned Owl. The Great Horned Owl loves the woods, and we have plenty of that here in the North Carolina mountains near Asheville, with hundreds of thousands of acres of National Forest. In fact, the Inn on Mill Creek B&B is located inside Pisgah National Forest, so we count the Great Horned Owl as one of our neighbors. The Great Horned Owl is a large, mottled grayish-brown owl, with a reddish-brown face. You might also be able to see its white throat and yellow eyes. And don’t forget those long ear tufts, that look like horns. A nocturnal bird, the best time to see the Great Horned Owl is at dusk. You might notice one sitting on a tree limb or a fence post. You may also see one flying, but thanks to its very soft feathers, it can fly without making much noise. It’s a predatory bird, with a diverse diet of mammals, rodents and birds (if only they would take care of the voles eating all our tulips. *sigh*). Wintertime is nesting time for our January 2015 bird. When it’s time to start a family, the Great Horned Owl picks its nesting spot, typically in a tree, and often using a nest that was built by another bird or a squirrel. Some of their favorite hand-me-down nests include those of hawks, crows and ravens. The Great Horned Owl might add it’s own touch to the nest of bark, leaves or feathers. 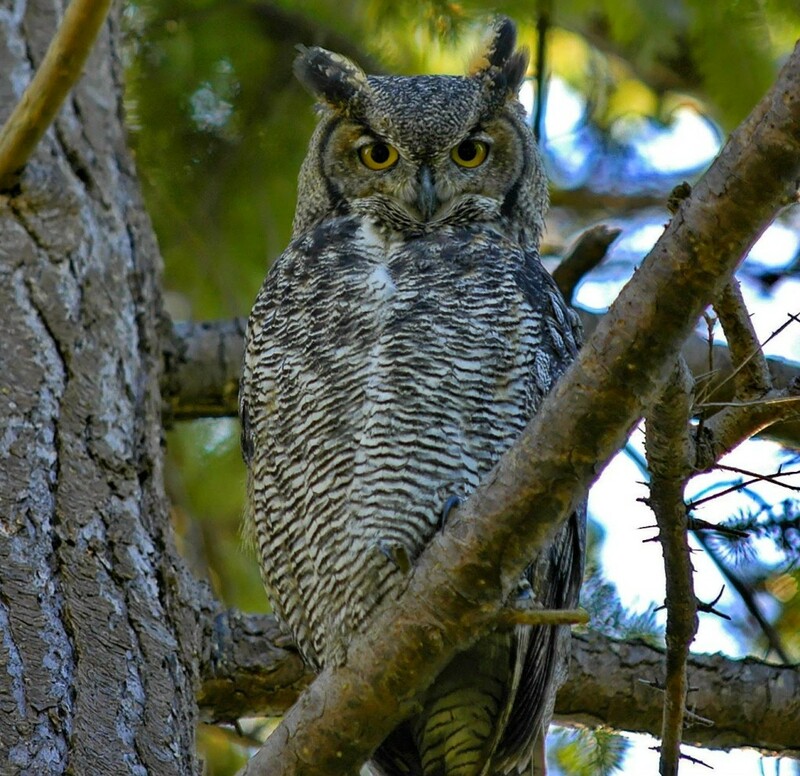 As mentioned, the Great Horned Owl can be found in the woods in our area, but they can also be spotted in other types of habitats all over North America and in parts of South America, in both cities and rural areas. It’s definitely worth going out as the sun goes down to see and hear this beautiful bird. This entry was posted in Birding in the North Carolina Mountains and tagged 12 Months of Birding at the Inn, birding by Inn on Mill Creek. Bookmark the permalink.